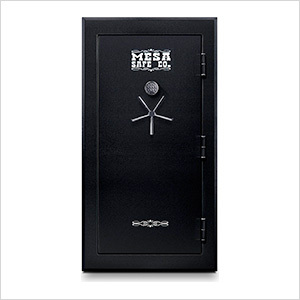 The Mesa Safe Model MGS45E burglary and fire gun safe is perfect for people who want to protect weapons, valuables and documents. Holds up to 45 long rifles. Fire rated for 30 minute at 1400°F, factory tested. Fully upholstered door panel, walls and shelves (fully adjustable shelving system to fit your storage needs). Decorative chrome 3 spoke handle. Equipped with a U.L. listed electronic Llock.